Biogas is mostly used as a fuel in power generators and boilers. For these uses, the H2S content in biogas should be less than 200 parts per million (ppm) to ensure a long life for the power and heat generators. Biogas can also be upgraded to pipeline natural gas quality for use as a renewable natural gas. This upgraded gas may be used for residential heating and as vehicle fuel. When distributing the biogas using pipelines, Canadian oil and gas pipeline standards may become applicable. According to Canadian oil and gas pipeline standards, the H2S content shall not exceed 4.6 ppm at 0 C. The CO2 level should be lower than two per cent (CH4> 95 %). Removing water vapor is less complicated than removing CO2 and H2S from biogas. Placement of a condensate trap at a designated location on the gas pipeline can facilitate the removal of water vapor as warm biogas cools by itself after exiting the digester. 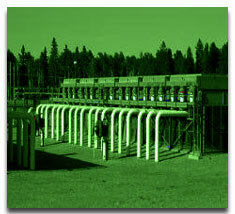 Western Biogas Systems advances technologies are designed to produce pipeline quality gas. Pipeline injection can offer significant revenue opportunities to biogas industries such as landfills, wastewater facilities and dairies. Producing pipeline gas quality requires the use of advanced and expensive technologies. The cost of cleaning and producing pipeline quality gas (renewable natural gas) is $3 to 6/GJ and $6 to 12/GJ, respectively.